The lap band procedure is a weight loss surgery that has become one of the fastest ways for many obese patients to lose weight. While there are other weight loss surgeries, the lap band procedure prides itself on being one of the most conservative and effective. The procedure is performed via a laparoscope and lasts about one hour. 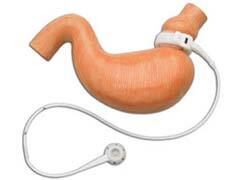 During the gastric banding a surgeon carefully places a lap band around the upper portion of a stomach to ultimately decrease its size. With the smaller stomach in volume, an individual feels full faster, and the advancement of food through the intestines is slowed down as well enhancing the weight loss effect. Recovery time varies depending on the overall health condition of a patient and possible complications after surgery. If you are seriously considering a lap band procedure, here are a few interesting facts for you to learn. As with all weight loss surgeries of this nature there are some lap band surgery requirements as to a patient’s body mass index, presenting pre-existing health conditions, age and medical history. Among these factors, a patient’s BMI is one of the most critical indications that a lap band procedure is indicated or counter indicated. Usually if a BMI is over 40 or over 35 but with extensive health complications caused by excessive weight, and a patient has previously tried losing weight unsuccessfully, he may be a good candidate for the procedure. Some patients may be misled by thinking that the procedure is an easy way out of their weight loss dilemma. On the contrary, in order for the operation to be successful a patient must prepare for it way in advance. Most surgeons advise their patients to adhere to a low calories diet for several weeks leading to surgery and to an all liquid diet for at least two weeks before the procedure. This is necessary to prepare the body to lose extra fat deposits around organs and to decrease the size of liver. The adjustable gastric band procedures vary in cost depending on the provider and may end up costing you from $17,000 to $30,000. Certain insurance plans may cover some costs associated with the procedure if patients meet such criteria as body mass index from 35 and above 40 associated with dangerous health conditions triggered by excessive weight like diabetes and heart disease. In addition, in order to qualify for the coverage a patient must display previous failed attempts of weight loss. Despite the fact that a lap band procedure is not as invasive and irreversible as laparoscopic gastric bypass, the recovery period is very time consuming and demanding. After the procedure a patient is expected to stay at the hospital for at least three days to establish a normal digestion pattern. A liquid diet is a must for at least two weeks post surgery. Later, very soft and mostly pureed foods are introduced amounting to no more than 800 calories daily for the following 18 months period. During this time, the lap band may be tightened or loosened depending on the patient’s condition and weight loss results. Not all patients are aware that there are some shocking complications that can be encountered with a lap band procedure. According to an article on Dr, Mercola website, nearly 50% of patients required removal of gastric bands for various reasons, including band erosion, band slippage, post surgery malnutrition, obstruction of the stomach and difficulty swallowing and passing stools. Though a lap band procedure is a reversible surgery, the complications and risks by far outweigh the weight loss benefits that could otherwise have been accomplished by diet and exercise. You might be wondering how much weight one can lose with a lap band procedure. On average most patients lose about 100 lbs of excessive weight within the first year following surgery and may continue to lose weight up to three years afterwards. However, weight loss is very individual and depends on many personal health factors. Though lap band is by far more conservative compared to, for example, a gastric bypass performed by virtually reshaping a stomach into several smaller pouches, it is still a major health intervention with its own set of risks and potential complications. It is still a weight loss procedure that will require major commitment on a patient’s part as to following a strict diet and medical supervision for several years post operation. The lap band procedure is a common surgery in the United States. It is considered to be relatively safe and all of the surgeons who perform the procedure must undergo extensive training that is mandated by the FDA. The surgeon will discuss the surgery with the client to ensure that all questions are answered. This helps with the recovery process as well. Several studies and researchers have found the lap band procedure to be one of the most popular methods to losing weight among morbidly obese patients.